We've been spending a lot of time with Jesus and yet sometimes, it can feel like the words we are reading, the parables he is sharing are making no sense at all. Do you feel like one of those, described in 4:12; seeing but never perceiving and hearing but not understanding. This can be frustrating and maybe you feel like giving up, but please don't. I want to encourage you and urge you to persevere, God will honour your commitment. The disciples spent all their time with Jesus, listening to him, watching him and following him, yet they still didn't understand and asked many questions. Jesus answered their questions and explained things to the disciples when he was alone with them (4:10). It is difficult with others around, with noise and bustle to concentrate well enough to hear and understand. What time are you spending doing this, or any study with God? Are you reading it on your phone while you're out and about? Are you skimming it in front of the TV or while you're waiting for the kettle to boil? Are you taking any time to think about what you've read? Jesus wanted to spend time with his disciples and he wants to spend time with you, do you have that same desire to spend time with him? Do you know how much Jesus cares about you? Jesus cares about the small things in your life, the everyday things. Look at the little girl in 5:35-43, he brings her back to life, and then he tells those at the house to give her something to eat. He doesn't just heal or transform and then leave, he takes care of the little needs in life as well. Why is it when things go wrong, when we're not getting the answers we want or we feel like God isn't talking to us, we think he doesn't care? In the boat the storm raged around them as Jesus slept and because he doesn't respond how they expect, they immediately think he doesn't care (4:35-41). When in their life did Jesus give the disciples cause to think he didn't care? What has Jesus done (or not done) in your life to make you think he doesn't care? Jesus cares for you, he wants to spend time with you because he knows it's good for you. Not just so you can learn, but because you need quiet, you need to be with him and you need to rest (6:31). What did the disciples need to rest from? The word 'crowd' is used nine times in these three chapters, that's a lot of people! It's a lot of healing, praying and serving. How crowded is your life right now? It may be full of good things, it may be God things that you are doing, but sometimes life gets crowded. God is your refuge, your hope and he listens as you pour our your heart (Psalm 62). Are you not hearing and understanding because you're not taking time to? 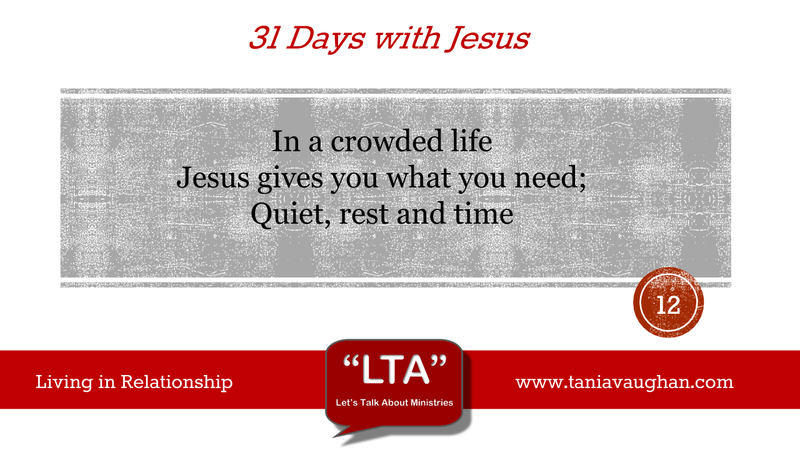 Do you need time alone with Jesus? How can you schedule that in to your diary in this coming week? Lord, I thank you that you care about me, not just in how I can serve you but in the small things in life. Thank you that you want to spend time with me, give me that same desire in my heart. I want that quiet and rest Lord, show me the crowd in my life and help me to reorganise and prioritise so that I don't lose sight of you in the pressing crowd of life. There are some great passages here that give us glimpses of the heart of JC. Firstly there is Legion - a collection of tortured souls - begged not to be sent out and despite the evil Jesus has compassion. Secondly I feel the faith of the bleeding woman, her desperation must have been unbearable! JC could have just accepted the outpouring of his power but jesus stops, finds her and acknowledges her faith - now there's a relationship that she'll never let go! And after all that Jesus still goes and honours his promise to go to help the little girl. The point is that, as you highlight, we need to make time for God. How busy are we before we go to church on Sundays? We seem to need or busy lives to be full every minute - yet we wonder why we can't hear God! He does care about the small things! Amen. Visiting from Women helping Women. Blessings. Welcome Nanette thank you for visiting.